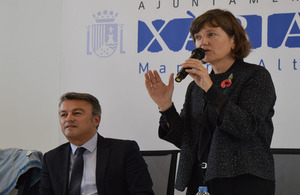 At open meetings in Jávea and Teulada this week, British Consul Sarah-Jane Morris encouraged British nationals to register locally with the Spanish authorities and asked them to only go to official sources for information on the implications of the recent EU referendum. With almost one fifth of local residents British, Jávea ranks in the top ten towns in Alicante for British residents. Nearby Teulada also has a considerable British population. At the well-attended meetings, the Consul was keen to stress the need to register locally. We are feeding back statistics on how many British nationals are living in Spain so the UK government takes you into account when planning our exit from the EU. The only figures we have are provided by the Spanish authorities – those on the padrón and those with residencia. It’s therefore crucial that you are registered locally so that we can effectively represent you in this process. The Consul suggested that those having trouble registering could request the services of a local gestor administrativo, or legal secretary, which are commonly used in Spain to assist with paperwork. In Jávea, Doris Courcelles, councillor for EU residents, said that local residents could visit her for help in registering with the town hall. Updates and further information will also be published on the official ‘BritsinSpain’ Facebook page.